Improve employee recognition with these fresh ideas! When employees feel valued, their engagement and productivity rise, and they are motivated to do their jobs better. Recognize employee value with the help of this recognition resource. 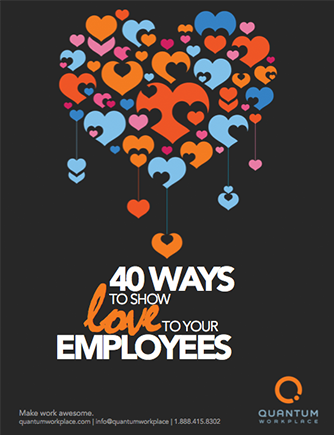 This ebook will give you 40 proven, fun, sentimental, and fresh ideas so you can give your employees the recognition – the love – they want and deserve. #10 Donut Stop: Put donuts in an employee's cube or team's area. Encourage employees to stop by to say congrats and grab a treat! #24 Brag Boards: Create a peer-to-peer recognition board where employees can post coworkers' outstanding work and excellence for the entire organization to see. #34 Wax On, Wax Off: Give employees a professional car cleaning while they're at work. Save some money and do the detailing yourself. Get your free copy for more employee recognition ideas, and share them with coworkers and friends!